Few flowering vines rival jasmine (Jasminum spp.) for fragrance, beauty and ease of growing. 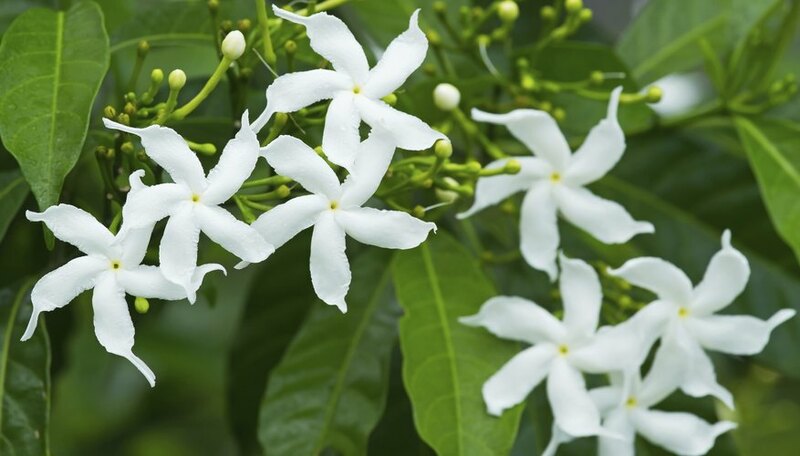 Common jasmine (Jasminum officinale), pink jasmine (Jasminum polyanthum) and angel wing jasmine (Jasminum nitidum) are all common varieties, each sharing a similarly sweet fragrance and starry flowers. Although they vary slightly in appearance, bloom time and hardiness, all jasmine species share similar growing requirements. Gardeners have two options when growing jasmine vines: they can grow them in the ground or in pots. Choosing a method depends on a couple of factors, most significantly the local climate. Angel wing jasmine resents the cold and will only grow reliably outdoors within U.S. Department of Agriculture plant hardiness zones 10 to 11. Pink jasmine performs best in USDA plant hardiness zones 8 to 10, while common jasmine is hardier and will survive in USDA plant hardiness zones 7 to 10. Tender varieties can be grown in pots and brought indoors during the winter, although larger species such as pink jasmine quickly outgrow their planters and may prove too large for long-term container cultivation. Full sun exposure to encourage abundant blooming and dense foliage. Moderately fertile soil to help support vigorous growth. Fast drainage to prevent root problems. Plant outdoor jasmine in a south-facing bed with a sturdy trellis or other structure for support. Jasmine tends to spread out, so keep that in mind when choosing a location. Smaller, tidier varieties such as angel wing jasmine need 3 to 4 feet of space, while pink and common jasmine must have at least 8 feet of space. Pots provide a great option for gardeners in cooler climates or those with limited garden space. Sambac jasmine (Jasminum sambac), which grows best in USDA plant hardiness zones 8 to 11, works best for long-term container cultivation due to its tidy, shrublike growth habit. Plant in a pot that is 2 inches larger in diameter than the vine's original nursery container, and use standard potting soil. Make sure the pot has multiple drainage holes at the base. Keep them under the same conditions as garden-grown vines, and move tender varieties indoors to a warm room with south-facing windows during the winter months. Jasmine is a relatively carefree vine to grow, but it benefits from regular watering and feeding during the growing season. Water and fertilizer are especially important to potted jasmine due to their limited soil. Jasmine needs roughly 1 inch of water each week, whether from rainfall or from a hose. Water deeply but infrequently during the summer months, and allow the soil to dry out completely on the surface before watering again. Weekly watering is best in most areas, although more frequent watering may be necessary during times of extreme heat and low rainfall, especially if the vine shows signs of stress such as wilting. In winter, water garden-grown jasmine plants only if no rain falls for longer than two weeks. Potted jasmine needs more frequent watering, so check the soil twice weekly and water whenever the soil feels dry on the surface. Water until the excess liquid drains from the bottom of the pot and let the soil dry out in the top 1/2 inch between waterings. Potted jasmine needs less frequent watering during the winter months; let the top 1 inch of soil dry out, then water until the soil is very moist and let the excess water drain off. Jasmine is not a heavy feeder, but most vines benefit from extra nutrients during the spring and summer months to support their vigorous growth and rampant blooming. Jasmine grown under light shade needs less fertilizer than those grown in full sun; don’t feed them if they look spindly or if their leaves turn yellow. Mix 1/4 teaspoon of water soluble, 15-15-15 or 7-9-5 fertilizer with 1 gallon of water. Water once a week with the fertilizer solution. Discontinue feeding garden-grown jasmine in mid- to late autumn and during the winter months so the vine has a chance to rest. Resume feeding in spring once all frost danger has passed and the soil has warmed. Continue feeding potted jasmine year-round, but dilute the fertilizer by half during the winter months. What Plants Are Native to India?